Reynaers (second from right) and Khalaf (centre) along with Al Tijaria officials after the deal signing. 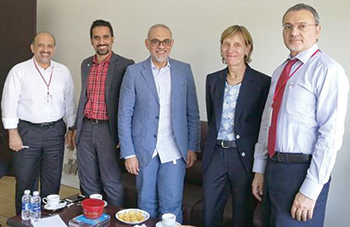 The Belgium-based firm will supply aluminium systems mainly comprising the ES 50 series of doors and the CW 50SC curtain-wall series for the 46-storey Al Tijaria Tower, boosting the list of iconic projects undertaken by the company in the region, according to Ali Khalaf, managing director of Reynaers Middle East, the regional office for Reynaers Aluminium. 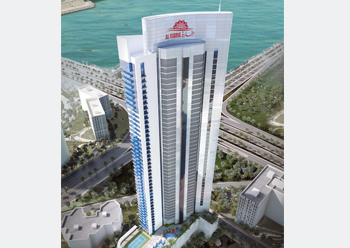 The 46-storey Al Tijaria Tower in Bahrain ... Reynaers to supply bespoke doors and curtain-wall solutions. Khalaf said bespoke solutions, also called OS solutions, have been developed to specifically meet the architect’s vision and requirements as regards to the performance specifications of the doors and the specific look of the curtain-wall. Fabrication of the aluminium systems will be done by the Bahrain-based Ashbee Metal Cladding. “For example, a new vent solution has been devised for the ES 50 door series for Al Tijaria tower to offer significantly enhanced air- and watertightness as well as acoustic insulation specifications. And for the aluminium façade, a new transom and mullion profile was developed to achieve a specific interior look of the façade,” he explained. Reynaers Middle East is the Bahrain-based regional subsidiary of Reynaers Aluminium, a leading European specialist that manufactures and markets innovative and sustainable aluminium solutions for windows, doors, curtain-walls, sliding systems, sun-screening and con-servatories. Apart from a wide range of standard solutions, the company also develops tailor-made solutions for all market sectors – from residential to commercial and industrial projects. Reynaers’ high-quality systems meet the most stringent demands in terms of comfort, security, architectural design, and energy-efficiency. It acts as a valuable partner for architects, fabricators, solar installers, project developers, investors and end-users. Founded in 1965, Reynaers employs over 1,770 workers in 40 countries worldwide and exports to more than 70 countries on five continents.